The Hampton Bay 20-inch LED flushmount ceiling light offers high-quality LED illumination that is perfect for kitchens, laundry rooms, closets, garages and basements. The frosted white acrylic lens distributes light evenly and has a low profile design that can be mounted on either a ceiling or a wall. Its lightweight construction makes installation easy. Dimmable, this versatile flushmount features long-lasting, energy efficient LED technology that produces 2200 lumens of bright white light (4000k Correlated Color Temperature). Equivalent to 150 watts of incandescent light, it uses only 30 watts of power, saving up to $660 in energy costs over the life of the fixture. ENERGY STAR certified and CUL rated, with its integrated LED design, there are no bulbs to replace! This Commercial Electric flush mount ceiling light features a satin bronze finish and opal glass shade. This simple, elegant design compliments any interior dcor. These fixtures are built with steel to last, and they are suitable for damp locations. They can be easily installed, with hardware included. Globe Electric's LED Integrated ENERGY STAR 11In Flush Mount brings an elegant and traditional look to any room. Compatible with a dimmer switch this fixture is fully dimmable, allowing you to add a desired mood or ambiance to any room. Ideal for use in basements, bathrooms, bedrooms, dining rooms, entryways, hallways, kitchens, and living rooms you can save money throughout your entire home. With the ENERGY STAR stamp of approval, using only 15.9 watts and a lifespan of 45.7 years when used for three hours a day you are sure to save time and money in energy costs and efficiency. Includes all mounting hardware for quick and easy installation. Globe Electric's Pennington 10In Flush Mount Ceiling Light two pack set brings an elegant and traditional look to any room. Fully dimmable with a compatible dimmer switch you can create the desired mood for any situation. Ideal for use in basements, bathrooms, bedrooms, dining rooms, entryways, hallways, kitchens, living rooms and more this set is a perfect way to update your space. Includes all mounting hardware for quick and easy installation and requires 2x E26 Type A bulbs (sold separately). Hampton Bay LED Ceiling Flush Mount is offered in Bronze and Brushed Nickel Finish. Includes beautifully crafted 13" alabaster glass shade. Integrated LED's module built into the fixture offering 35,000 hour lifetime. No bulb to replace and virtually maintenance free. ENERGY STAR certified to help save money, energy and the environment. Uses 70% less electricity than traditional bulbs to produce the same light output. Low wattage and low heat. Energy saving product, great for hallways, bedrooms, stairways, basements, garages, indoor porches and any other area where a high quality LED light source is required. 20-inch Round LED Flushmount Ceiling Light in White - ENERGY STAR® The Hampton Bay 20-inch LED flushmount ceiling light offers high-quality LED illumination that is perfect for kitchens, laundry rooms, closets, garages and basements. The frosted white acrylic lens distributes light evenly and has a low profile design that can be mounted on either a ceiling or a wall. Its lightweight construction makes installation easy. Dimmable, this versatile flushmount features long-lasting, energy efficient LED technology that produces 2200 lumens of bright white light (4000k Correlated Color Temperature). Equivalent to 150 watts of incandescent light, it uses only 30 watts of power, saving up to $660 in energy costs over the life of the fixture. ENERGY STAR certified and CUL rated, with its integrated LED design, there are no bulbs to replace! 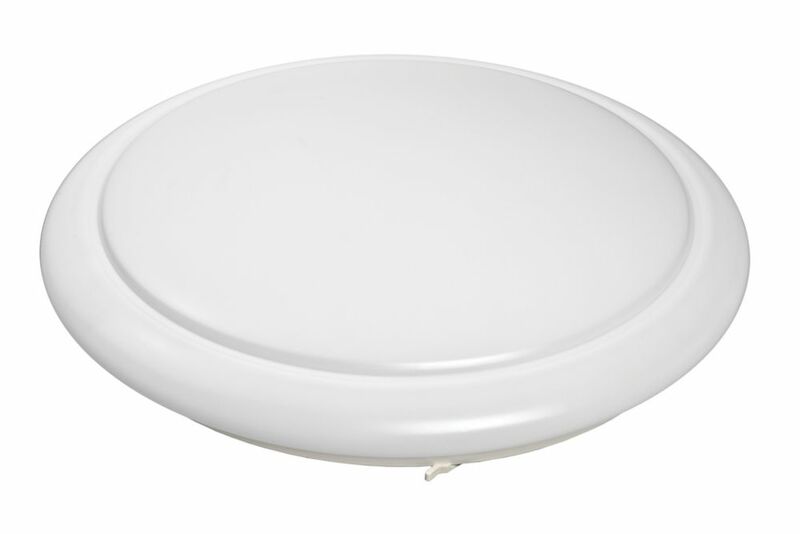 20-inch Round LED Flushmount Ceiling Light in White - ENERGY STAR® is rated 4.5 out of 5 by 4. Rated 5 out of 5 by Serge Levert from Good, good, good Is exactely what i want, good product, vert simple to clean! Rated 5 out of 5 by C123 from Exactly what I wanted I bought this for my kitchen. I wanted something that I wouldn't have a shadow when I was at the kitchen sink. This light was perfect! Rated 3 out of 5 by Peter999 from Not very bright Bought this to replace a kitchen fixture. While the light quality is good and the brightness reasonable, this is not the 2200lm (150W equivalence) as advertised. I believe it is closer to 1600lm (100W equivalence). Not a huge problem as I had the ability to install two of these (removed a spotlight). So the savings were modest the light quality is a little better (in terms of temperature and flicker). So my review is neutral. I have seen led fixtures that gave me the light volume I expected but they are twice this price. So I get value for money but not the bargain. The other thing to watch out for is these require the new type of dimmers not the old resistive type, but I didn't need a dimmer given the light volume so maybe I saved in that.